The diatonic accordion, better known as “ORGANETTO” was born in Austria in 1829 by Cyrill Demian, a manufacturer of organs and pianosin Vien. 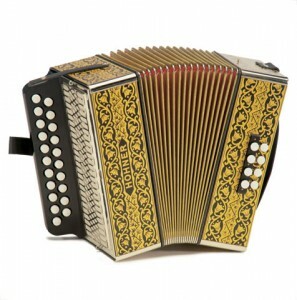 The original instrument, called “accordion” , was equipped with a bellow operated by the left hand, a small box containing free reeds capable of producing sounds. These reeds were and are of the bitonic type, meaning capable of producing different sounds depending on the opening of the bellows. The construction of organs at dizzying pace between 1870 and 1900, with the birth of many factories, located in the Marche region in particular (Castelfidardo, Italy), Lombardy (Stradella, Cremona) and Piedmont (Vercelli). The accordion is amusical instrument belonging to the free-reed aerophone family (instruments whose sound is generated by air flow) of the mechanical type (air is produced by a bellow or bellows) and provided with reeds. The reed is a thin flap of steel that vibrates under the flow of the air, thus producing sound. Both the keyboard melody (right hand) and the harmonic one (left hand) are provided with button keys. For each button there are two different sounds, depending on whether the button is pressed by opening or closing the bellows (bitonic or diatonic system). Among the varoius types of organs, the mosst widely used in traditional Italian music are the accordion 2 bass and the accordion 8 bass, although the 4 and 12 bass types are also common.